Great to have access to a local weather expert for my area. App could use some fine tuning. I get 2-3 alerts each time an updated forecast is posted. Works as described. My daily go to source for athletics related weather concerns. I love this app! The forecasts are easy to understand and make it so much easier to understand what to expect throughout the week. So worth it! I can't live without this app! I'm getting multiple updates with the same time stamp. Why? By far the simplest and most creative weather app I have seen to this date. There is no BS, it tells you exactly what you want when you want it. Kudos to the creator of this app, they should be in charge of making more interfaces for other apps! 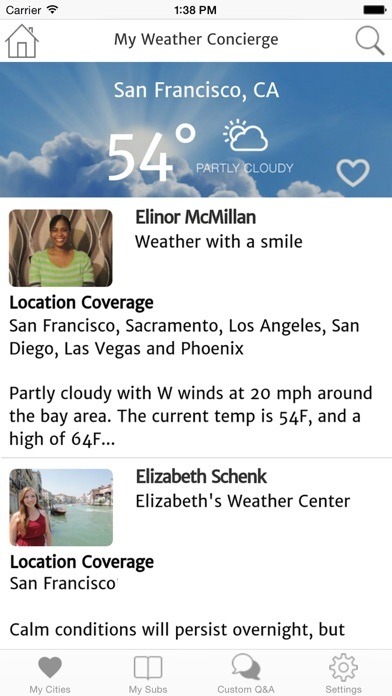 Even though there are free weather apps, this one is worth it for 99 cents a month. Ari Samuelson for the NY area is so dedicated and updates the most accurate weather. He is definitely worth subscribing to. The only one I trust!! 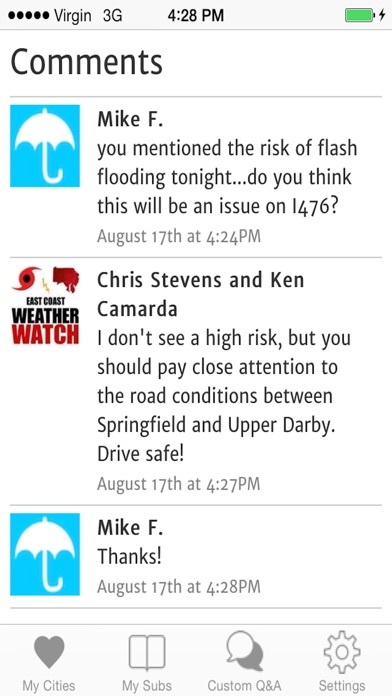 My weather concierge is the only place I go for weather information. They are reliable, honest and most importantly accurate! I had to come write a review after the winter we had. They were always up to date practically to the minute with every storm. My SKEPTICAL husband always asks, "what does your weather concierge say". 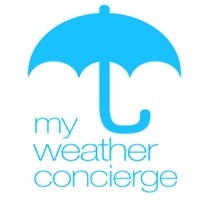 He too only trusts My weather concierge! Keep up the good work guys. We love you from Commack NY! Finally a weather app that doesn't say it's raining when it's not. The weather is the only thing I check when I'm rushing out the door so accuracy is key. 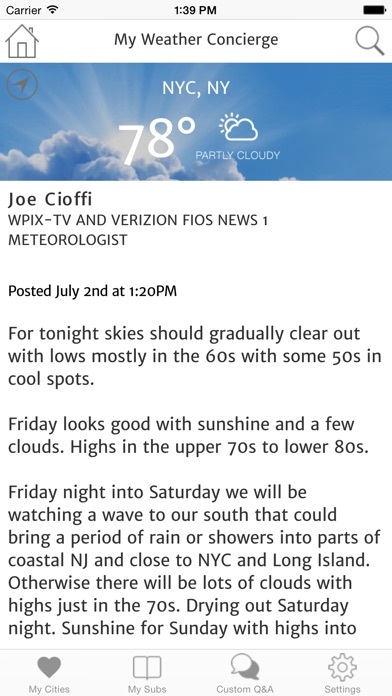 The weather channel could learn a thing or two from my weather concierge! If you are looking for an app that gives you the real deal when it come to weather-- not hype-- then this is the App for you. It's like having my own personal weather guru 24/7! I love it!